Ever wonder what would happen if a handler and a tractor got it together? That's the revolutionary Merlo MultiFarmer-the best features of tractor AND handler combined into one machine. In the original TOP build and the simplified CLASSIC build with analogue instruments! Multifarmer entered the UK in 2002. With a clear view of the 4 tonne lift rear linkage, and a 100HP mechanical PTO, the Multifarmer has a very practical tractor ability. And, at the front, there's an optional front PTO and a levelling front axle. 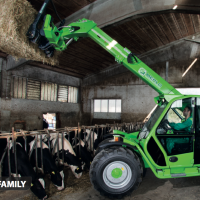 As a handler, the Multifarmer lifts 3000 kg - a very useful handling capacity around any farm. And, it has a ‘change on the move’ version of the 40kph transmission of other Merlo handlers, with a new DEUTZ engine. In October 2005 the Multifarmer2 was introduced with a new cab for increased vision and comfort.